This fabulous melt-in-your-mouth recipe was submitted by my Aunt May in Sydney. Salmon is something I’ve always had a bit of a funny relationship with. For as long as I can remember every Christmas we’ve had smoked salmon as our pre-starter (because the starter has always been French Onion Soup), served with capers and a wedge of lemon. Every year. One year we deviated by having gravadlax, but that was seriously pushing the boat out, so the following year? Smoked salmon. Capers. Lemon wedge. We are a family of tradition if nothing else. It’s the same with this pan-fried veal and creamy mushroom sauce dish Momma Lee used to make us when we were younger. It was a weekly occurrence on the menu until one day Papa Lee put his knife and fork down and announced, “Y’know something? I hate this dish,” at which point Brother and I both (in great relief, I might add, because this honestly was a dish we all hated) set our knives and forks down and chimed in, “Us too! It’s horrible!” Bless Momma Lee. She merely raised an eyebrow and said something along the lines of, “I’ve been making you this dish for ten years and you only tell me now that you don’t like it? !” and to be fair it’s not a bad dish. It had just been made far too many times for us to see its merits any longer. Needless to say, it never appeared on the dinner menu (or any other menu) again. How does this relate to salmon, I hear you ask? Well having had smoked salmon for so long (at every special occasion and every Christmas) I now find it very hard to eat. Any smoked fish, in fact. I have been ‘smoked fish spoilt’. 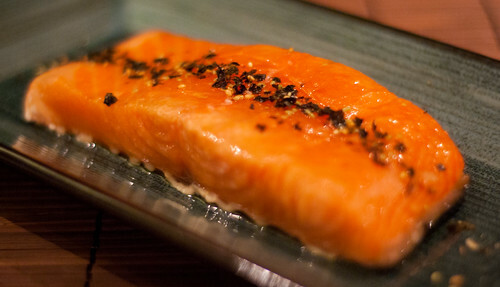 Poached salmon or salmon sashimi? No problem whatsoever. But smoked? Blech. No thanks. Does that make me crazy? Maybe a little, but I think we already knew that I didn’t have all my marbles in a row up there (or something along those lines… wait, do you even line up marbles? Why would you do that?). Long story short, I was somewhat dubious when I received this recipe. It called for curing the salmon for a very long time (well, 3-4 hours, but for an impatient cook like me who is often loathe to even let the cake cool down so that I can frost it, this seems like a long time) in a mix of brown sugar, salt, alcohol and dill, then baking it at a very low temperature for 12-15 mins. As soon as I saw the word ‘cured’ in the title I thought, “uh-oh. Am I going to like this?” Well folks, I can tell you that not only did I like this, I loved it. Literally. If I could’ve married this piece of fish and had babies with it I would’ve. It was that good. It not only tasted amazing but it absolutely melted in my mouth. I was making these obscene sounds and shoveling it into my gob, because I’m a total lady when it comes to delicious food… NOT. My Aunt May tells me that this is one of her party pieces she likes to whip out to impress her guests. The only flaw I see in that is that there probably wouldn’t be any fish left to serve as I’d have eaten it all already. Sorry potential future guests. Word of warning: use very fresh fish. Very, very fresh. I got mine from my local fishmonger, caught that morning, and it was gorgeous and delicious. But as it’s cooked for such a short amount of time (although the curing will help to kill germs) you really must use the freshest fish possible. Enough babble, anyway. You should definitely make this, and I’m re-publishing it exactly as I received it because it was just so well-written. It was a party in my mouth and everybody, even the Pope (sorry the Pope’s visiting London this week and causing general transportation havoc; no more Pope jokes… okay one more: I wonder if he kicked his morning off with Eggs Benedict? ), was invited. Enjoy and thank you Aunt May! Delicious and wonderful recipe. 1. Mix together all curing ingredients except for dill and place half of it at bottom of shallow roasting pan. Add half the dill. 2. Lay the salmon filet skin side up on the curing mix. 3. Put the remainder of the curing mix on top of the filet and cover with remaining dill. Wrap tightly with cling film and weigh down with beer or soup cans. 4. Refrigerate for between 3-4 hours. 5. 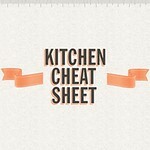 Remove cling wrap from filet and lightly rinse with water. Pat dry with paper kitchen towel. 6. Preheat oven to 90 degrees C. Place cured filet on baking paper in a shallow roasting pan. Add 50ml of water to the pan (underneath the baking paper so that the fish is not soaked in the water). Brush top of fish with olive oil. Seal the entire roasting pan tightly with tin foil. 7. Bake in oven for 12-15 mins. Remove from oven and unwrap foil. The filet should still look very pink; almost uncooked, but it will be warm to the touch and it will melt in your mouth! Sprinkle furikake on top of fish before serving. 8. Serve with crushed hot potatoes and a nice sauvignon blanc. *Furikake is a sprinkle traditionally used on rice balls and it typically comprises dried bonito; sesame seeds; seaweed; salt. They also come in a variety of other flavours. #Use this curing mix or your favourite curing mix for gravalax. 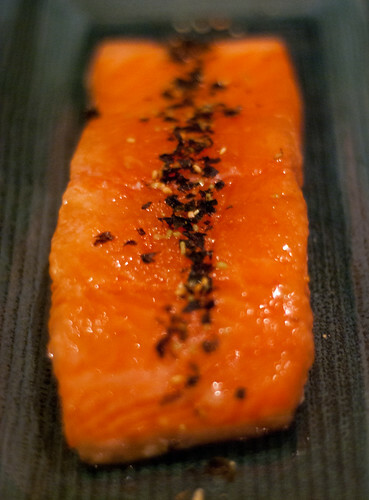 Curing the fish for 8 hrs or overnight (turning once) will produce a flavourful gravadlax. There you have it, then. Tasty, tasty fishy dishy. I should also note that my furikake also had a little wasabi in it, which was lovely, but if you want a pure unadulterated version you can find it in any Asian supermarket. So friends, until next time. And hey, if your partner/mother/friend/dog keeps making you a dish that you’re not into you should speak up now or forever hold your peace. Don’t wait ten years to do it. Peace and love. 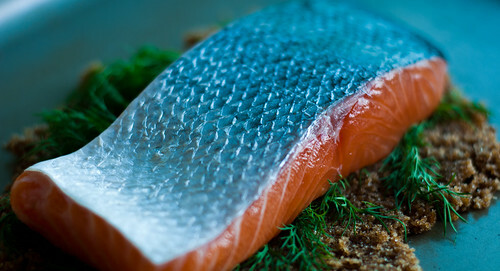 Cured salmon is one of my favorite things to make… and these pictures look fabulous! Melt in your mouth indeed! I have never made (or tried) cured salmon. Can you believe it? I wish I lived closer to fresh seafood, but alas I'm still miles inland. At least I'm closer to the sea in Austin than I was in Colorado! I agree with Brian, your photos look great. Thanks for sharing sweet woman! I'm with Monet – never had cured salmon before. But you make it sound so stinkin' delicious! I wish I could find some good fresh fish here, but it's close to impossible. Me too, never had cured salmon before too. But that thick salmon fillet in the picture does make my mouth waters though! Brian – thank you lovely! It was seriously melt-in-your-mouth delicious. I will definitely be making it again. Chanel11 – oooh, let me know how it turns out for you! You should've seen what a disaster the quinoa cake was when I was frosting it. I was practically pouring the frosting back on the cake as fast as it was melting! Mgoh – if you can get hold of some fresh salmon definitely give this one a try! I challenge anyone not to love it. Well. Anyone who likes fish, that is! Hi, Jax. I recently made gravlax and really enjoyed it (so now friends are copying me here on the island). BTW, I voted for you; as featured publisher who's not competing (trip to your land), it should help. Funny, Foodbuzz doesn't make it very easy to vote for your pals from the site…. You are more than welcome, Samantha! Try it out – it’s totally delicious!